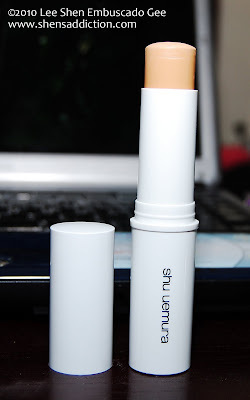 I was first introduced to Shu Uemura Nobara Cream Cover Stick Foundation by John Pagaduan of Shu Uemura when he used it on me for my hosting gig at Quorum Anniversary party. Seeing how flawless the results were on me, I just had to get one... and I did. Three types of oils, gliding, light and emollient, combine to enhance the foundation’s spreadibility, creaminess and comfort felt when applied to the skin. Available in 13 shades, this new-generation foundation makes it easy to not only match virtually every skin tone, it also allows the ability to achieve precise highlight and lowlight effects by applying several different shades. 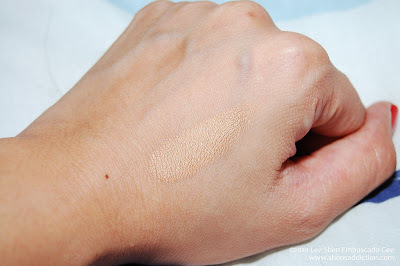 I've been using the Nobara Cream Cover Stick Foundation since I got it early December. I even took it with me for an out of town wedding. Its compact container makes it so easy to tote around everywhere. The way they revamped the cult fave Nobara Cream Foundation definitely benefited a lot of beauty enthusiast like myself. No worries that your foundation will accumulate dirt and bacteria with this tube-like container. As an aspiring makeup artist, this is a major convenience because it's easier to clean up and won't take too much space on our kits. Pop the cap, twist and apply. So, that's a definite plus on the packaging! Coverage-wise, I never regretted getting this off the shelf since. This cream foundation provides a coverage of a concealer. Its incredibly light and smooth formulation allows an easy application. I apply this war-paint style. Two swipes on the forehead, one wipe over the tip of the nose and across the chin. I use either my MAC 109 brush, a regular latex sponge or my Beauty Blender pink sponge to blend all the swipes together. Never tried to use any regular synthetic foundation brush with this foundation. So far, so good, the results were amazing. The best thing about this foundation with such coverage is that I can use it everyday. Since I've acquired a lot of dark spots from my dried up pimples, having a foundation to cover them up aside from my favorite mmu foundation is a dream. Especially on those need-to-hurry-woke-up-late days. It does not cause me to break out (actually, all Shu Uemura Cosmetic products don't make me breakout) nor does it clog my pores. The foundation can provide a light to heavy coverage depending on how much product you apply. For me though, with a little help of concealers for my cystic pimples and dark undereye problems, one application is enough. Such application can last up to 5 to 10 hours depending on how oily my skin get. How much product left after more than a month of use. 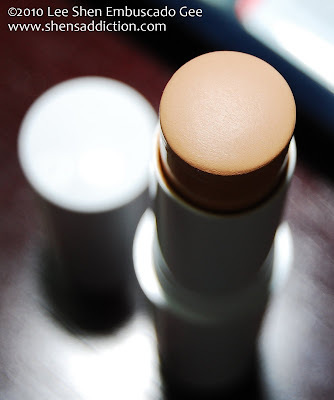 For Php1900.00, this foundation can last you probably 2 to 4 months, depending on how frequently or how much you use. Suffice it to say, I'm impressed with this foundation hands down. No wonder why most reviews I've read on it could only say the same. The packaging, the coverage and the tons of shades available for almost all skin tones are just something many can't passed up. Most of all, anyone could certainly use this even those you are using makeup for the first time. It's just a no-brainer, you see. Shu Uemura Cream Cover Stick Foundation is available at Shu Uemura counters in Rustan's Shangri-la, Rustan's Glorietta 3 or at Shu Uemura botique at Powerplant Mall. im thinking of buying nobara... but which is better? the face architect smoothing liquid foundation or the nobara? thanks! I use Bobbi Brown in warm beige. Is this lighter, darker, or a perfect match? Thanks!